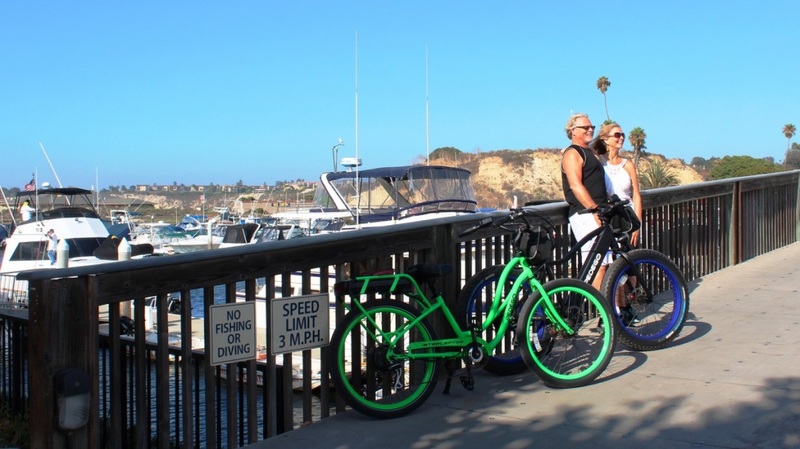 On the Go with Pedego: 22 miles of Southern California coastal bike trails and cliffs in a day! Today we are on the go with Pedego electric bikes! 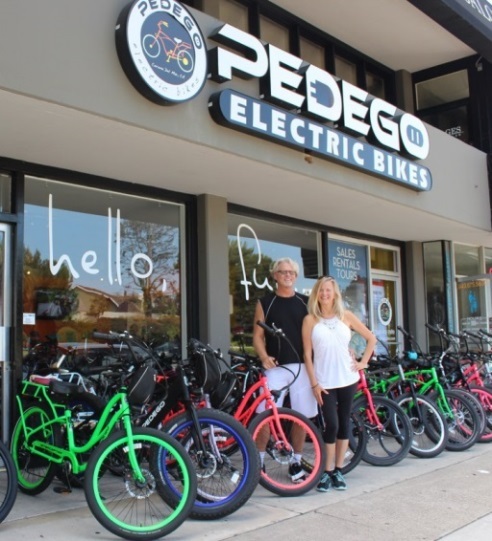 And lucky for us, we were able to pick up our rental bikes from the Pedego Corona del Mar store in Newport Beach. I, Koz, picked out a cool blacked-out Trail Tracker and Christina opted for a wild lime green Interceptor. These bicycles are awesome. Pedego has 12 different models with everything from fat tire trail bikes to foldable electric bikes. Yes, foldable! They can easily fit right into the storage compartment of your RV. You can get a custom trailer for these bikes to haul surfboards or cart around the kids, along with handy saddlebags for small supplies. They even have an electric bicycle built for two! All geared up, we set out to cover 22 miles of Southern California coastal bike trails and cliffs in a day, beginning our sojourn in the Newport Dunes Waterfront Resort and Marina, and ending in the Upper Newport Bay Nature Preserve and Ecological Reserve! We met Kelly, our guide and we were off! Within a few minutes we stood in awe at the beautiful Newport Beach coastline. From this vantage point, we could see Balboa Pier and Newport Pier off in the distance. The cauldron of soft sand, beautiful bluffs and the sound of crashing Pacific waves are magical. Standing here just puts all of life’s little worries into perspective. Our Boomer Venture began as every stop was cause for excitement. Our next venture took us to the world-famous Crystal Cove State Park. Because we were on Pedego bikes, we were able to ride the Crystal Cove Historic District 12-mile Loop easily as part of our day trip. We leisurely pedaled along on our Pedegos as we took in the views, motored up the inclines, and stopped to take photos to capture the memories. The ride up to the Resort at Pelican Hill would be challenging at best if it weren’t for the power of Pedego. The powerful 48 volt battery pulled my 195lbs up the long step hill with ease. With an incredible 60-mile range, you confidently attack almost any terrain. These bikes are sooo cool! You can pedal like a normal bike with various speeds and then use an easy-throttle via your right hand to kick-in the power of the battery. Pedego also has a Pedal Assist feature which automatically kicks in when you pedal, so there is no need to use the throttle unless you want an extra burst of speed. You always have complete control of the riding experience. The long downhill ride back towards Newport Dunes is exhilarating and there are generous bike lanes. Again, the views of ocean, hills and expensive homes are amazing. The Upper Newport Bay Nature Preserve and Ecological Reserve is made up of the bluffs surrounding the Bay and have approximately 1,000 acres of open space. You are instantly immersed in the rich smell of grasslands and coastal sage scrub, beautiful blue waters and the sweet sound of twittering birds. During winter migrations, up to 35,000 birds can gather at the Bay at one time. Considered a “critical estuary” habitat— Upper Newport Bay is one of the most pristine remaining estuaries in Southern California. Gliding effortlessly on miles of wide bike path, the silent Pedego electric motor seamlessly blended with nature’s beauty. Every Pedego store will provide you with maps and helpful instruction, and if you’re a first-time visitor to Newport Beach, we highly suggest a seasoned tour guide for a big adventure like ours. We would have NEVER seen all the fantastic vistas and beautiful bike paths without Kelly’s guidance. As a local native, she knows every secret bridge, bike path and bluff vista and Back Bay trail. 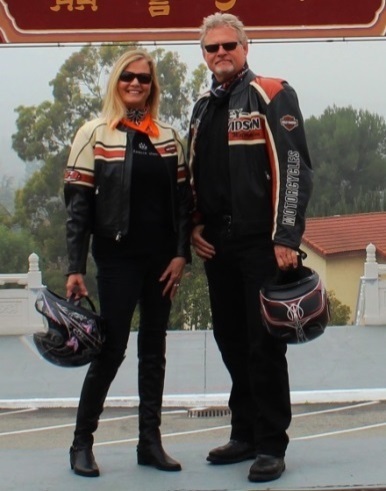 Boomer-Ventures promote an active lifestyle for Baby Boomers.